OMNeT++ projects provides a component architecture for modelling environment. Components (modules) are programmed using C++, then assembled into larger components.Some model in Omnet++ is programmed in high level language such as NED.Omnet is a simulation framework not a simulator by itself.and Omnet++ is an important simulator programs which is used to simulate various network domain. We offer Omnet+ + projects to simulate following areas such as MANET(mobile ad hoc network), VANET(Vehicular Ad hoc Network), WSN(Wireless sensor Network), LTE(Long Term Evolution), and WBAN(Wireless body area Network). We simulate software defined network by using Omnet++ simulation framework. We develop Omnet++ projects for all CSE and IT students under the degree of Bsc, Msc, BCA, MCA, B.Tech, M.Tech, B.E, M.E and MS, and PhD students. 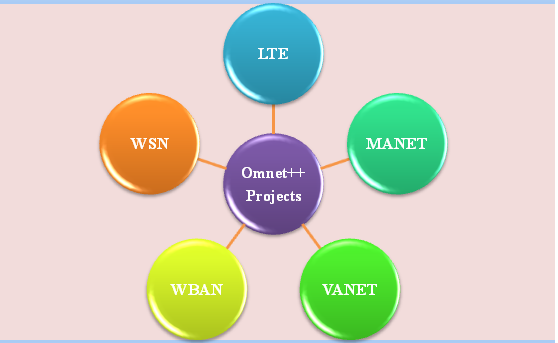 We develop various network related projects in Omnet++ environment. We provide Omnet++ simulation framework to ensure reliable flexible service to satisfy user needs. We adopt various simulation tool such as MiXiM, Castalia, INET, SUMO , veins and protocol such as IPV6, TCP/UDP and MPLS are implemented by OMNET++ for final year projects.Till now we have deployed more than 150+ Omnet++ Projects. We implement vanet in Omnet++ to reduce accident ratio in highway track which utilize Adhoc network which establish routing path from source node to destination node as vehicle. We efficiently implement vanet is Omnet++ tool. We introduce vein an open source simulated framework in Omnet++ ensure realistic simulation for VANET process from Springer journal papers.By Omnet++ simulation framework we can simulate vehicles, sensor communication, roadway, alert message transformation, vehicle to road (V2R) and vehicle to infrastructure (V2I) communication. We use INET for wired and wireless communication process. We provide protocol model for vanet, P2P, overlay and LTE network communication. By INET we ensure support for mobility, MPLS signaling and MANET. We evaluate WI-FI, WI-MAX and ZigBee wireless communication. We ensure SDN to centralize network architecture. We separate control logic and computer resource by central controller. SDN is a mixture of SDN controller, north bound and south bound APIS. Our main aspect in SDN is controller which manage overall network such as nodes, router, switch, gateways. We establish Omnet++ framework for SDN and open flow standard for SDN communication. We developed more than 95 projects in SDN with OMNET++ simulation. We establish WSN communication by Castalia, INET and MIXIM framework in Omnet++. We simulate cross layer model, sensor and radio communication, power consumption in WSN are done by PAWIS (power aware wireless sensor) in Omnet++. We enhance Castalia as well defined simulation framework for protocol distribution in wireless channel and analyze various application behavior. We implement wireless body area network for medical application which use wireless sensor to monitor health information of physically disabled peoples. By WBAN device we measure ECG, blood pressure, body temperature and glucose level. We deploy wireless body area sensor nodes, interference, node communication and health monitoring process by Omnet++. We provide communication among wireless sensor nodes and actuators in wireless body area network and simulated by Castalia framework.